Selenium is a trace element and horses and ponies generally only require a few milligrams in their diet. Selenium is an essential nutrient in a horse's metabolism - but there are areas in the UK where the ground is deficient in selenium, resulting in a need add a selenium supplement a horse's feed. The levels of selenium in grass, equine forage, hay and grains such as oats and barley depend on the amount of selenium in the soil on which they were grown. Selenium is important for the production of antibodies in the horse for a better immune system and the production of thyroid hormone that can affect equine growth rates. It is also a powerful anti-oxidant. Selenium Deficiency in Horses and ponies. If a horse doesn't get sufficient selenium in his feed, he may suffer with problems such as tying up and muscule cramps. A lack of selenium may also mean that wounds and infections take longer to heal. Many vets recommend feeding a selenium and vitamin E supplement to horses that are prone to tying up or azoturia. An equine veterinary surgeon >can determine if your horse is suffering from a selenium deficiency by taking a blood test, and can give advice on creating effective and safe supplementation. It is also worthwhile to consult an equine nutritionist to establish the recommended levels of selenium for your horse. Vitamin E is often fed to a horse in conjunction with selenium as they work together - these two key anti-oxidant nutrients are an important part of the horse's detoxification system. They can protect the horse's red blood cells from damage during exercise. Selenium is a naturally occuring mineral found in the soil. Equine selenium supplements are most commonly manufactured from selenide in sulfide ores of silver, copper or lead. 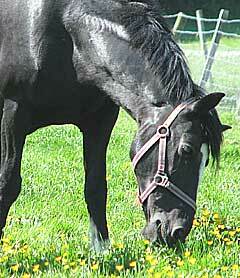 Take care if you decide to feed a selenium supplement to your horse or pony. Selenium can be toxic in high doses. If high levels of selenium supplements are fed to a horse over a period of time, chronic poisoning may occur. Selenium toxicity can produce symptoms such as hair loss from the mane and tail, diarrhoea, blindness, separation of the hoof wall from the horse's foot, colic, increased respiration and heart rates. However the benefits of feeding selenium supplements to horses and ponies do outweigh the risks providing care is taken not to over supplement your horse's feed with it.